More feathers in your war-bonnet! 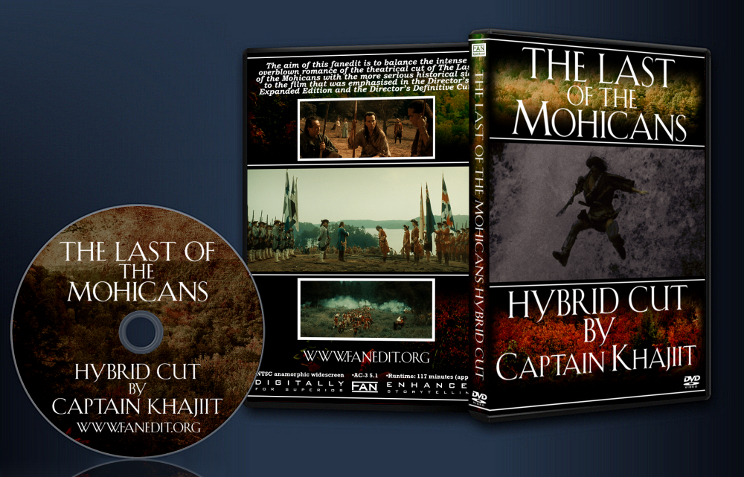 The theatrical cut of The Last of the Mohicans cut is loved for its kinetic pace and overblown romance. Both the two following cuts disappointed some fans, because they removed some of the quippy over-the-top dialogue and had a more serious historical focus. They had positive points: extended sequences that added depth, extra dialogue that added little nuances to the characters, and some edits to the original that did play out better. This cut aims to balance the positive points of all three cuts of the film to deliver a fuller experience. In particular, the character of Major Heyward is subtly altered. He still clashes with Hawkeye, but now seems a little more like him — the difference between them one of culture and mindset. Heyward now seems more capable, and his ultimate decision in the Huron village seems more intelligible. Unless new material is made available in future releases, this will remain the faneditor’s ideal cut of a film that he holds in high regard. He hopes others find it enjoyable. Thanks must be given to a number of people: Rogue-TheX for support and cover art, Throwgncpr for being willing to help, and jagabo, manono and poisondeathray for technical advice. -The line that was missing from the raising of the County Levy in the DEE is present. -I used the theatrical approach to Albany as it shows more of the bridge, which I like. -Uncas’ line “Find yourself a musket” is not restored. It makes Heyward seem more capable if he thinks of this himself. He is a professional soldier, trained in the European school of warfare, who is unaccustomed to warfare in the Americas, but he can still improvise. -Hawkeye’s “Clear it up any?” line is not restored in the default audio mix. The line made it seem as if Hawkeye was insulting the Major’s intelligence without, as yet, any reason to do so; without the line, the disagreement between the two men seems one of mindset, which allows the potential for the two men, eventually, to achieve a respect for each other. -I restored Hawkeye’s line, “Just dropped by to see how you boys is doin’” on entering the fort because I like the bravado. -The footage of the children in the French camp singing out of time with the music is not present, and the first conversation between Magau and Montcalm follows the DDE. -Hawkeye’s “I think one day you and I are gonna have a serious disagreement” line at the fort is present. -Major Heyward’s diversion is back. -Cora’s says, “The whole world’s on fire,” as she does in the DDC, not, “The whole world’s on fire, isn’t it?” as she does in the theatrical cut. Both versions of this line work, but I prefer the shorter one. -The full extended version of the parley scene is present, including the line about one British officer helping another. The latter was an annoying deletion from the DEE, in my view, as the other officers are obviously looking to Munro for a comment that never comes, and to cut to Heyward’s line seems unnatural. -The extended dialogue in the conversation between Magua and Montcalm after the Parley is present, with “Le Subtil” not “Magua”, to match lip movements. -The footage of the French entering the fort has not been used: I think the footage looks rough and there is some junk piled up on the left that looks, well, odd. -I have removed the assistant director with the megaphone and the baseball cap out of one shot by zooming it slightly. Unfortunately, fixing other goofs is beyond me at present. -Added Cora’s missing lines at the waterfall, as the attempts that Mann made to cut this sequence, although interesting, left one feeling that something was missing. -Hawkeye’s line to the Major on the lake has not been restored. This might be unpopular, but with the line it seems as if Hawkeye has shamed Heyward into not shooting; without it, he appears to make his own decision. This builds his character and makes his decision to sacrifice himself later on more plausible. It also links nicely to the earlier scene in which Hawkeye tells Heyward, “In case your aim’s any better than your judgment,” because Heyward now shows his characer by making the correct judgment (without Hawkeye’s cajoling). -The extra canoe chase footage is present. -In the default audio mix, the Clannad theme without English lyrics plays over the chase sequence with the new sunset shots, as in the DDC. On reflection, I like the sunset shots, and the song conveys the appropriate mood and feelings without the English lyrics spelling them out. -The DDC cut the scene in the Huron village and Great Sachem’s speech into two parts and, awkwardly, deleted Hawkeye’s line: “[would Huron] kill every man, woman and child of their enemy?” The reason for the re-ordering escapes me, as it diminishes the impact of Great Sachem’s speech. The original sequence of events has been recreated by recutting the Blu-ray footage and adding some better quality shots from the DEE. This is not a complete restoration of the theatrical sequence, as some shots differ slightly, but the effect is the same. -The brief new shots of the Huron gathering in the village have been retained. -The Blu-ray’s darker, richer color palette has been used, as the faneditor prefers it. Shots from the two previous cuts have been color corrected to match it. The color fluctuations have been removed from the film. -The audio mixes on the DDC and DEE had high dynamic ranges, which pleased audio enthusiasts, but irritated many others who had to scramble for their remotes. An attempt has been made to keep the volume level from fluctuating too much throughout the film, and a limited amount of dynamic range compression has been applied. -The extra shots of Cora and Hawkeye walking backwards out of the Huron village are not present. They were nice, but they slowed down the sequence. Major Heyward’s second scream, just before his death, has not been restored, in the default audio mix. On reflection, this makes Heyward stoic and more like Hawkeye than he first appears: Hawkeye’s two yells as he raced to save Cora in the second forest ambush have always been muted, so now there is a nice parallel between Hawkeye and Heyward. Without Hawkeye’s quip to Heyward on the lake, the moment near the end in which Hawkeye hesitates before shooting Heyward seems somehow more poignant. -The new sound of Magua’s knife as he cuts Uncas’ throat is used. I like the original sound, but the new sound is “nastier” and makes the slaying of Uncas seem more brutal. -The footage of Hawkeye comforting Cora after Alice’s death is present. -The theatrical ending is back. I like Chingachgook’s long speech at the end just as much, but this is unpopular, and there is something fitting about ending the film with the phrase, “Last of the Mohicans”. -Hawkeye’s line, “Clear it up any?” has been restored. -Cora now says, “The whole world’s on fire, isn’t it?” as she did in the theatrical cut, rather than just “The whole world’s on fire,” as she does in the DDC. -The English lyrics are present in the Clannad song. -Major Heyward’s missing second scream has been put back. -The original sound of Magua’s knife cutting Uncas’ throat has been restored. I wish this had been in HD. It was an almost perfect version of the movie, for me. Where I think it stumbled was in having 2 different audio tracks. Since the alternate track restores some dialogue not in the main track, that meant that the video had to leave room for the restored lines, which made for two awkward pauses. But, that's really minor stuff, considering everything else that this cut got so right. It's been a while since I've seen LotM, probably not since it was first on VHS. This edit was spectacular and the editing was invisible, I couldn't tell what had been cut or added. Without a doubt the definitive version of this great movie!